The space behind the instruction booklet is going to be a small strop. Use will determine if the strop is a stupid idea. I actually put some thought into the blocks. The most used angles by far are 30, and 25 degrees. I have yet to use 50, 35, or 40 degree angles. I placed 25, and 30 degree blocks in the middle so that they would be the most protected from mishap and so I would have holding area to either side for use with the honing guide. 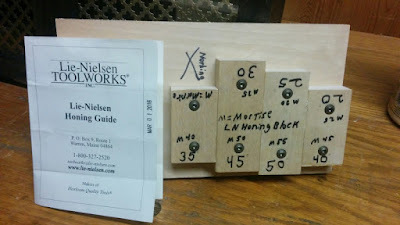 I have a similar jig for use with the cheesy $15 side clamping guide available all over the place. That experience went into making version 2.0 here. Even though I have the new precision guide, and associated jig 2.0, I have no plans to get rid of the old system. It is always good to have a backup. This sort of project is ready made for a CNC carver, or 3D printer. Unfortunately, I do not own either device, so I'm stuck with plywood and Kreg screws. The much anticipated new addition to the print woodworking community has finally shipped. 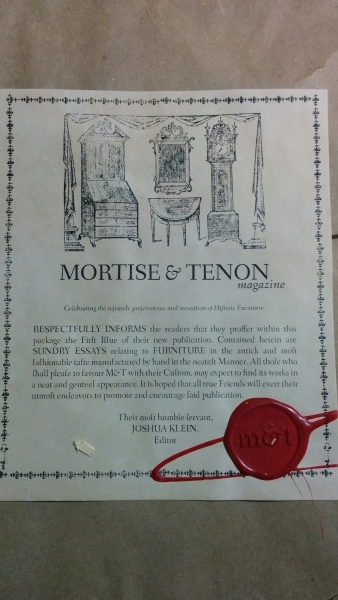 It is the brain child of Joshua A. Klein and Mortise & Tenon Magazine is his labor of love. My first impression of the packaging and presentation is classy all the way. 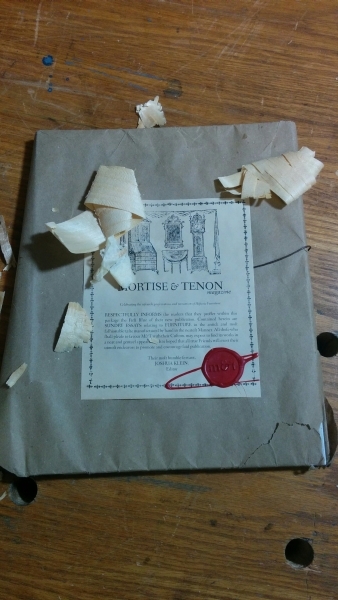 Under the mundane plastic mailer is a kraft paper wrapped present and a few real plane shavings. 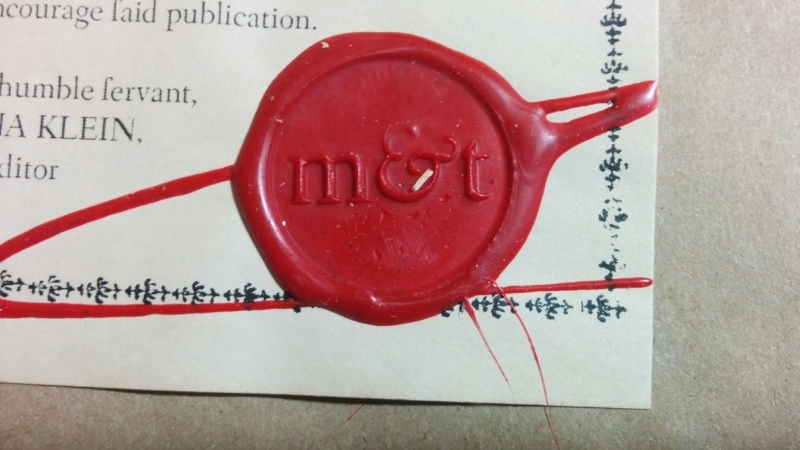 An introductory note and wax seal are your first clue that Mortise & Tenon is not the usual fare. The first impression after reading the magazine through once is that this is a content steak with a loaded content baked potato side, some content carrots, and content apple sauce for a sweet after taste. There are no ads in the magazine main body. For 139 pages you will find nothing but articles. There is a sponsor directory at the end, but even here it is tastefully done and separate from the content. Defining M&T is best done with the publisher's (and layout editor, and content editor, and janitor) own words: "The Emphasis of M&T is an unabashed celebration of pre-industrial woodworking". The emphasis is on the research, not the nuts and bolts (screws and dowels?). There are no cut lists, or measured drawings typical of a contemporary woodworking magazine. Joshua does not preclude such things in the future, but in the context of research to revive the past, not to get click-thrus, or newsstand eyeballs. After a couple of interviews is a technical article titled "Analysis of a Federal Boston Secretary". It is not a 'how to build' piece, however with the provided dimensions and a set of dividers, enough information is present for you to recreate this piece. My favorite article is from one of my favorite authors, George Walker. He talks of the mighty string and it's less agile cousins; I'll leave it at that, enigmatic on purpose. If you are reading this, then you have seen that I'm the Pragmatic Woodworker. My general emphasis is on building what I want/need when I want/need it. I will never be any kind of wood scholar, I'm not even sure I'll ever learn enough to confidently pass on to another. 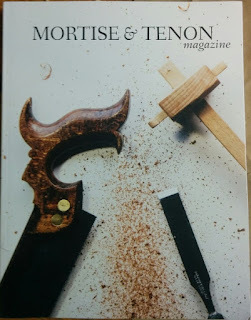 That said, I really did enjoy the first issue of Mortise & Tenon magazine. Of course, not every article struck a chord with me, but enough did to convince me to be a regular subscriber.